In the last post, Marcus Allbäck managed to guide his newly promoted Stockport side to a nice 7th place as the season reached half time. To catch up fully on the previous post, follow the link in the image below. “Marcus! You are to report to Mr Elgeti’s office straight away”. Marcus Allbäck hadn’t seen the owner’s secretary for as long as Rolf Elgeti had been missing. The summon made Marcus fear that Mr Elgeti and his cat had returned. Despite the instinct to walk in the opposite direction, he headed towards the office with determination in his stride. He reached the closed office door and the determination left him as quickly as it had come. He knocked on the door more cautiously than he had intended and suddenly realized that he was shaking. No answer. He closed his eyes and silently told himself to get a grip as he knocked harder on the door. Still no answer. He gently pushed down the door handle and the door slid open. The office seemed empty. No Mr Elgeti behind the desk and no fat cat in the corner. He took one step into the room, expecting Mr Cat in the Hat to jump him in an ambush from a dark corner but nothing happened. Marcus Allbäck dared to smile as he walked towards the desk. He looked around and everything seemed perfectly normal. Nothing in the room had changed since his last fateful visit. He was just about to leave as he saw it. A simple white envelope on the desk with a single word hand-written on it. “Marcus”. He shivered again as his hand reached for it, as if he was expected to be burned by a simple touch of the paper. He opened the envelope and revealed a single sheet of the finest paper money could buy. I’m sorely disappointed in your deviation from our plan. You are quickly destroying everything we worked so hard to build. Stop this Continental nonsense and return to the Sexi Brexi ways immediately. After even more tweaking the tactics from the first half of the season became a masterpiece of attacking football. Both players and spectators loved the fluid football and the team just kept on winning. 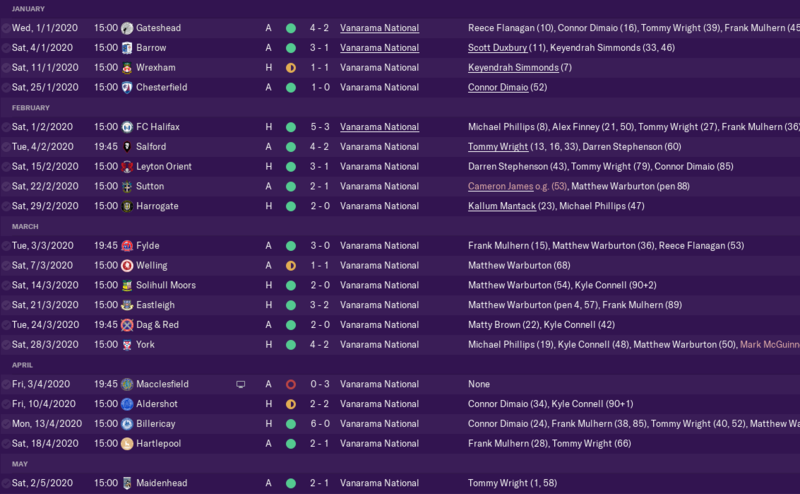 An amazing second half of the season was just enough to push the team past Chesterfield into a 2nd place finish, but the team missed the 1st place and automatic promotion by goal difference. However, the promotion playoff was quite uneventful as nothing could stop Marcus Allbäck’s footballing machine. The play-off final was probably the most one-sided game in the entire season, with Stockport beating Fylde 7-1, securing back-to-back promotions and a well-deserved comeback to the Football League! Besides the fact that it’s both more fun and challenging to play in League Two than the Vanarama next season this also means that the board has no choice but to turn the club fully professional. They have constantly been refusing Marcus Allbäck’s requests of turning professional for the last two years, but because of the Football League rules they now have no choice. This is great for two reasons; it will be easier to attract better players and it will also mean that the players will train 5-8 times a week instead of 0-2 times, hopefully halting the steady decline of player skills we’ve seen for the last two seasons and perhaps we’ll even see a youngster or two improve! Next we’ll look at how the players performed. Most of them did great of course, performing well over par achieving promotion. The star of last season Darren Stephenson had a good season again with 10 goals, 8 assists and 23 chances created. However, Tommy Wright and Frank Mulhern where the two players that really thrived after Marcus Allbäck’s transition to a more attacking football, with 20 and 19 goals respectively. Scott Duxbury continued to produce perfect crosses with 14 assists and 19 chances created to his name, very nice numbers for a left wing back! Besides the fact that the quality of the players is abysmal there are some serious issues regarding personalities as well, with four Unambitious and two Fickle. Last season Stockport hired a HOYD with a Professional personality with hopes of bringing in better youth players, but perhaps these poor intakes are simply down to the fact that the club have a fairly basic youth development. Grant Potts is the only player with a 4-5 star potential and perhaps the only one with the possibility of making it into the first team one day. Being close to two metres tall at the age of 15 combined with a Jumping Reach of 13 makes him interesting, especially as a centre back. He displays some decent mentals with Aggression, Bravery, Determination and Work Rate above 10. However he lacks the defensive skills needed at the moment with poor Heading, Marking and Tackling. Most likely he can develop these skills into the 10+ range but perhaps he is better off further up the field. He has a Dribbling of 11 and a decent Finishing of 8, so perhaps he can become the new Zlatan Ibrahimovic!? Either way, we will be keeping a close look at his development over the next couple of years. The board are offering a transfer budget along the lines of this season, just below €1M. 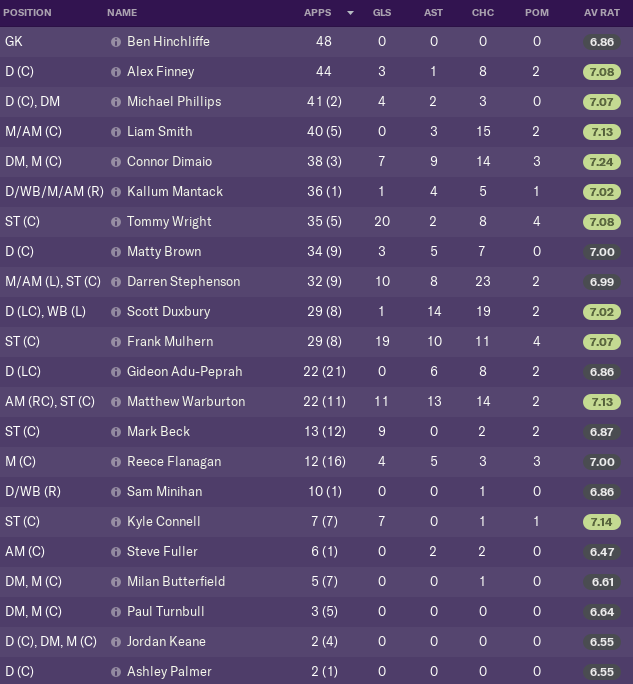 The wage budget continues to slowly increase, giving Marcus Allbäck some room to improve the squad for a season that surely will prove tougher than anything the team has faced before. Marcus Allbäck is 100% focused on doing a great job in League Two, despite attracting interest from a lot of clubs. With Rolf Elgeti away Marcus Allbäck will surely try to improve the attractive football that won the team promotion even more in hopes of avoiding relegation straight back down.